RoboGames is the Olympics of robots from around the world to compete in over 50 different events such as combat robots, fire-fighters, LEGO bots, hockey bots, walking humanoids, soccer bots, sumo bots, and even androids that do kung-fu. Some robots are autonomous, some are remote controlled. As an open event, anyone can join. The 9th annual games, RoboGames 2012 took place on Apr 20-22, 2012 at San Mateo Event Center in San Mateo, CA. Fifty-nine event took place and 682 Robots joined of 238 teams from 16 countries. Results from RoboGames 2012 are here. 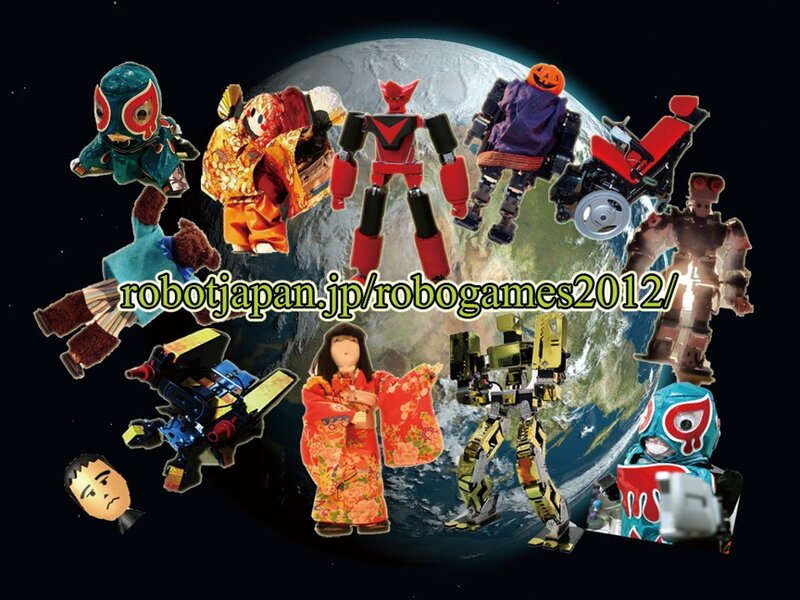 Team Robot Japan joined RoboGames 2012 and got 10 medals. Real King Kizer custom-built by Maru-san got the Best of Show Gold Medal. Kageki-san, Lem-san and Sanzai-san reported Team Robot Japan in their blog with cool videos and pictures. I tried to review games and to collect videos joined Team Robot Japan. Team Robot Japan robots were introduced in the Robot Japan's web site. The leaders of Team Robot Japan were Koguma-san and Kazuko-san were introduced in Kageki-san's blog. Promotion Video of Team Robot Japan also uploaded as Robot Japan US Tour 2012, Robot Japan US 2012 Tour-2 and Robot Pro Wrestling US Tour 2012 by Lem-san. Zaura custom-built by Kenta-san is a member robot of Robot Pro-Wrestling `Dekinnoka!'. Ryuketsu Kamen, KHR-3HV based wrestler robot by Oamata-san who is sponsor of the Robot Pro-Wrestling `Dekinnoka!. Tokotoko-Maru custom-built by Amino-san is well known as Japaanese classical Japanese dancing robot. Real King Kizer custom-built by Maru-san moves as Real Steel Robot with 100 cm height. Kazumin is a KHR-3HV based robot by Oguma-san. Kazugon is a KHR-3HV based robot by Kazuko-san. Thunder Bolt, custom-built by Shibata-san is also a member of the Robot Pro-Wrestling. 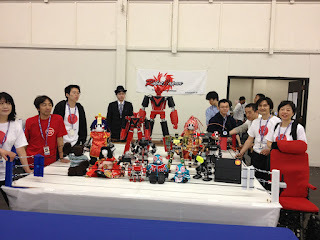 Kageki-san reported Team Robot Japan in RoboGames 2012 on the 1st day, 2nd day, 3rd day part 1, part 2 and part 3.